The disciples spoke in the language of every nation. 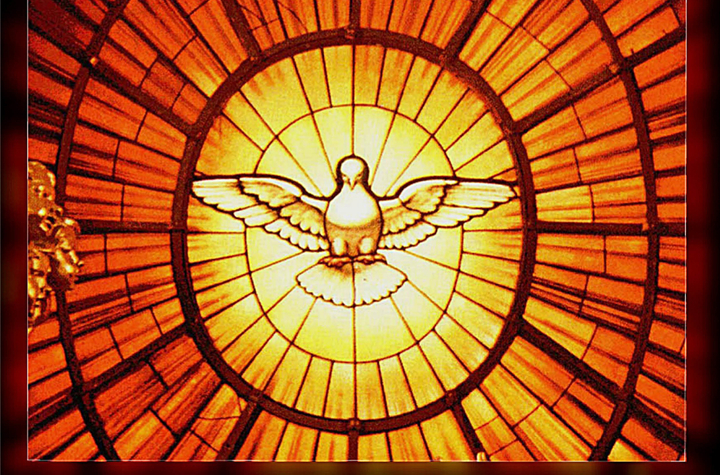 At Pentecost God chose this means to indicate the presence of the Holy Spirit: whoever had received the Spirit spoke in every kind of tongue. We must realize, dear brothers, that this is the same Holy Spirit by whom love is poured out in our hearts. It was love that was to bring the Church of God together all over the world. And as individual men who received the Holy Spirit in those days could speak in all kinds of tongues, so today the Church, united by the Holy Spirit, speaks in the language of every people. This was the way in which the Lord’s promise was fulfilled: No one puts new wine into old wineskins. New wine is put into fresh skins, and so both are preserved. So when the disciples were heard speaking in all kinds of languages, some people were not far wrong in saying: They have been drinking too much new wine. The truth is that the disciples had now become fresh wineskins, renewed and made holy by grace. The new wine of the Holy Spirit filled them, so that their fervor brimmed over and they spoke in manifold tongues. By this spectacular miracle they became a sign of the Catholic Church, which embraces the language of every nation. Keep this feast, then, as members of the one body of Christ. It will be no empty festival for you if you really live what you are celebrating. For you are the members of that Church which the Lord acknowledges as his own, being himself acknowledged by her, that same Church which he fills with the Holy Spirit as she spreads throughout the world. He is like a bridegroom who never loses sight of his own bride; no one could ever deceive him by substituting some other woman. To you men of all nations, then, who make up the Church of Christ, you, the members of Christ, you, the body of Christ, you, the bride of Christ—to all of you the Apostle addresses these words: Bear with one another in love; do all you can to preserve the unity of the Spirit in the bond of peace. Notice that when Paul urges us to bear with one another, he bases his argument on love, and when he speaks of our hope of unity, he emphasizes the bond of peace. This Church is the house of God. It is his delight to dwell here. Take care, then, that he never has the sorrow of seeing it undermined by schism and collapsing in ruins.